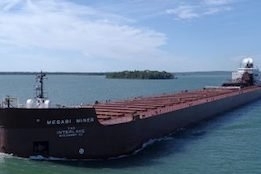 Interlake has become the first U.S. Great Lakes shipowner to join Green Marine. Green Marine today announced that the Interlake Steamship Company (Interlake) has become the first U.S. Great Lakes shipowner to join the maritime industry environmental certification programme. "Green Marine certification aligns well with our strategic initiatives regarding the environment," said Interlake President Mark W. Barker. "We have a long-term vision for our industry and we are investing in our ships and our equipment to offer the most reliable, efficient delivery within an industry that is already the greenest form of transportation available." The Green Marine environmental programme features 12 performance indicators to enable ship owners, port authorities, terminal operators, and shipyards to voluntarily reduce their environmental footprint. "We're absolutely delighted to welcome Interlake," said David Bolduc, Green Marine's executive director. "With its visionary fleet modernisation over the past decade and all the investments made towards more sustainable operations, there's no doubt that Interlake is committed to continual environmental improvement, which is the core of the Green Marine program." In 2015, Barker told Ship & Bunker that the Interlake would postpone plans to use liquefied natural gas (LNG) bunkers for emissions control area (ECA) compliance, instead turning to exhaust gas scrubber technology and HFO.